The struggle goes on, and this recent report by a leading British newspaper sums up the awfulness of life in Cambodia today. Politically little has changed in Cambodia since our last letter. The Khmer Rouge (Cambodian communists, backed by the Vietcong and North Vietnamese) still hold large areas of the country while the government defends a series of outposts, major cities and the capital, Phnom Penh – about ten to twenty per cent of the land mass. Although over 80 per cent of the country is under insurgent control, 85 per cent of the people live in government controlled areas. The fact is that the large majority of Cambodians remain unconquered. Day and night artillery and rocket attacks, more intense since Chinese New Year, have left large areas of the capital in ruins. Over two hundred have died in the shelling since Christmas, with hundreds injured, and in January over half the French population of 1,000 left Phnom Penh. All roads out of the city are cut and the price of a plane ticket to safer cities such as Battambang and Kampong Cham is out of reach of most Cambodians. There is no way out for the poor but to cross the front lines and no one is contemplating that. Food shortage, looting, inflated prices and student unrest all add to the troubles in Phnom Penh. The Khmer Rouge claim to have 14,000 troops and say they will continue bombarding the capital, attack Mekong River convoys and finally enter the city, but this last claim is not likely unless things rapidly deteriorate. As things are at present this stalemate could continue indefinitely as neither side has the resources to win an outright victory; it seems that Cambodia is in for a long and wasteful struggle for survival. Normal life is difficult; most schools have had to shut down, especially those with French teachers. Many shops have been closed too and a strict curfew has existed for some weeks now. French doctors in Phnom Penh report that as a consequence of the privations of war, cases of night-blindness – induced by vitamin deficiencies – are appearing for the first time in Cambodia since medical records were started by the French in 1861. This letter is an introduction to the work that God is doing in Cambodia. Many Christians in this country have expressed concern for the situation in South East Asia and especially in the war-torn lands of Vietnam, Laos and Cambodia. The latter has been perhaps the most neglected over the years by Christian Missions and the Church worldwide. For the past two years the north eastern region of Cambodia has slowly come under the control of North Vietnamese and Vietcong guerillas, and a naturally peace loving people have been thrust into a war for national survival. Up until recently, the prospects of holding the capital had not been good, and at one point – when the American bombing stopped – the general opinion was that Phnom Penh would be taken. This, however, did not take place, and news from Cambodia by Western reporters states that the city is functioning fairly normally under the circumstances. Nevertheless, though food is available, prices have rapidly escalated, and with over one million refugees in Phnom Penh the situation is not good as supply routes are continually threatened. There are also increasing numbers of orphans and homeless, the natural result of war. For Christians in Cambodia there is an open door of opportunity. The war has brought with it a sense of insecurity to a people who are normally happy with their lot. The Church has a new boldness which is acceptable in the situation and the Asian manner of preliminary introductions before plain talking is slowly disappearing in the face of questions like, ‘what can we do?’, ‘who can help us?’, ‘is there a God?’. By practical means wherever possible, and by showing calm and compassion for the people, the Evangelical Churches and Christianity itself are gradually being seen in a new light, as a positive and distinctly Cambodian way of life, relevant to them today. The door to Cambodia is wide open – the Gospel must go out while there is time left. A land of seven million (approximately the population of Scotland) needs to know that Christ can give them hope in a future that looks pretty bleak. Major Taing Chhirc who spent 18 months in Britain was the means of awakening many of us to the urgency and need of prayer for Cambodia. Little has been known about this land closed to the West for many years, and now we realise the situation, prayer would seem to be all the more urgent. May the Lord Jesus Christ be exalted through the testimony and faithfulness of His people worldwide. 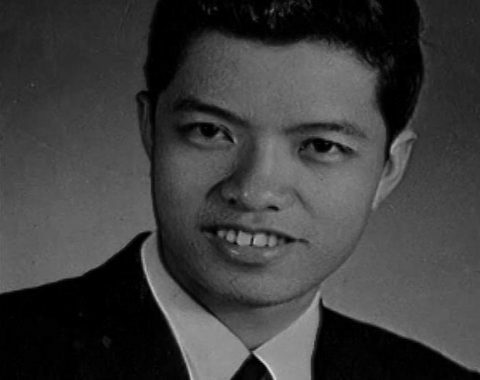 In 1972 Major Taing Chhirc, a Christian officer in the Khmer National Armed Forces and General Secretary of the Cambodian Evangelical Church, left Cambodia along with his pregnant wife Bophana to study in the UK. In 1973 the pastor of Bethlehem Church, Sem Bun, wrote to Chhirc asking him to return to Cambodia, where the church was growing rapidly and needed his help. Before leaving the UK, Chhirc spoke at the Keswick Convention. He appealed to British Christians to get behind Cambodia in prayer and support. To this end, Chhirc’s British friends Paul and Helen Penfold formed Cambodia for Christ, now Cambodia Action. Chhirc left his wife and child in Edinburgh, UK, while he remained in Cambodia until the Khmer Rouge took power in 1975. According to one witness, a few days after the fall of Phnom Penh Chhirc was in the town of Neak Loeung among a group of panicked, bewildered people, offering them the hope of Christ. Suddenly, five or six Khmer Rouge cadres appeared and, without warning, clubbed Chhirc to death while the stunned crowd looked on. After its formation in autumn 1973, Cambodia for Christ published an occasional newsletter to inform Christians in the West about the situation of the church in Cambodia. These newsletters are fascinating historical documents set against the backdrop of the final months of the Khmer Rouge military campaign against the Khmer Republic. In 2013, Mr Randolph Parrish of Scottsdale, Arizona, USA, kindly sent to CCC a set of Cambodia for Christ newsletters for the period November 1973 to March 1975, requesting that they be preserved. With the permission of Cambodia Action, which evolved from Cambodia for Christ, we shall be publishing extracts from these newsletters over the coming months.